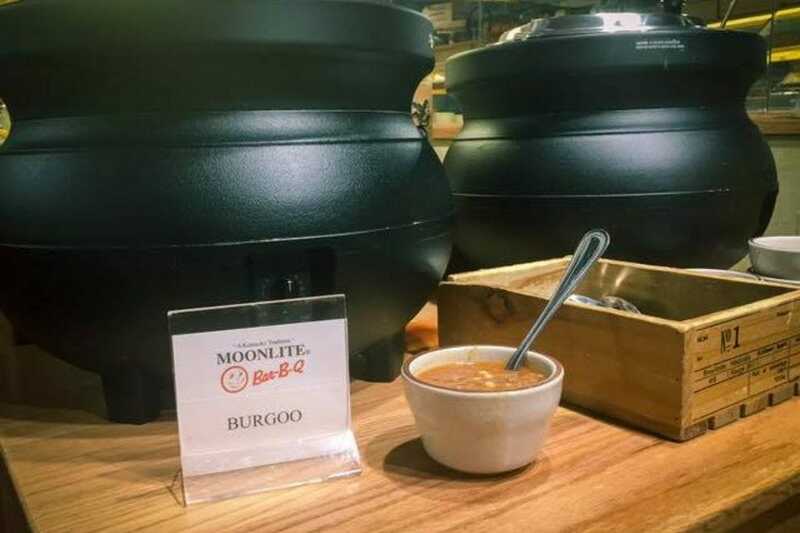 How do you burgoo? 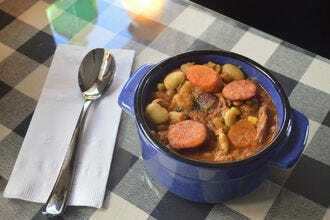 Unless you happen to have spent time in Kentucky’s “burgoo belt,” you might not be familiar with this highly regional stew that’s a staple on the menu of barbecue joints throughout the state. This dish has competing origin stories; some say that it came from Wales and found its way to Kentucky via Virginia. Others claim it was created by French chef Gustave Jaubert while serving a Confederate general in 1860. There are multiple variations of the dish as well, with meats ranging from beef, chicken, pork and mutton to pigeon, rabbit and squirrel finding their way into the stew pot. The Firehouse Sandwich Shop, located at Buffalo Trace Distillery in Frankfort, serves up a range of Kentucky favorites, including a hearty Kentucky burgoo made by local burgoo master Russ Kennedy. 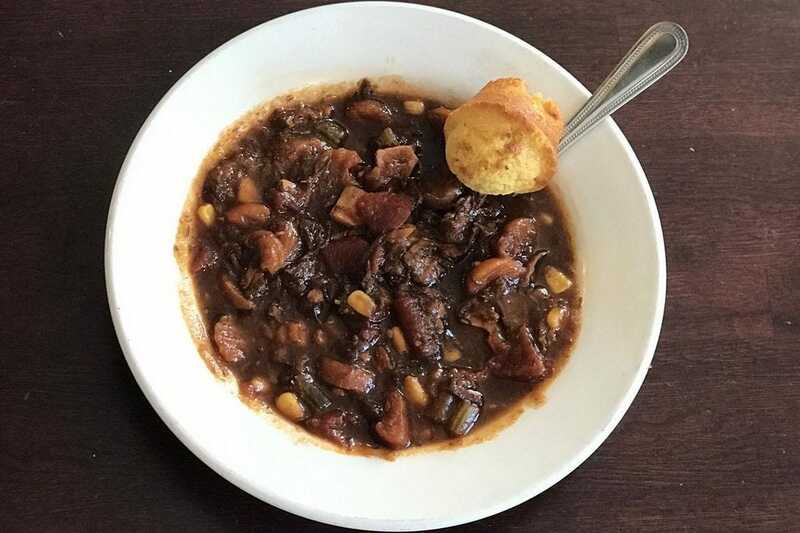 Hungry travelers in Owensboro craving a warming bowl of soup have two choices at Moonlite Bar-B-Q Inn, a bean soup and a hearty burgoo, both served with two cornbread muffins and crackers. This version comes with mutton, chicken and a variety of vegetables. Old Hickory Bar-B-Q began in 1918 when Charles “Pappy” Foreman began barbecuing mutton on a pit in Owensboro. 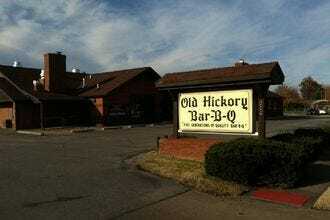 Today, Old Hickory remains in the same family, though the menu has expanded. The burgoo’s meaty mutton flavor is balanced with a tomato tang. Everything from Shack in the Back BBQ in Fairdale is homemade in their kitchen each day, and that includes the burgoo, available throughout the year. 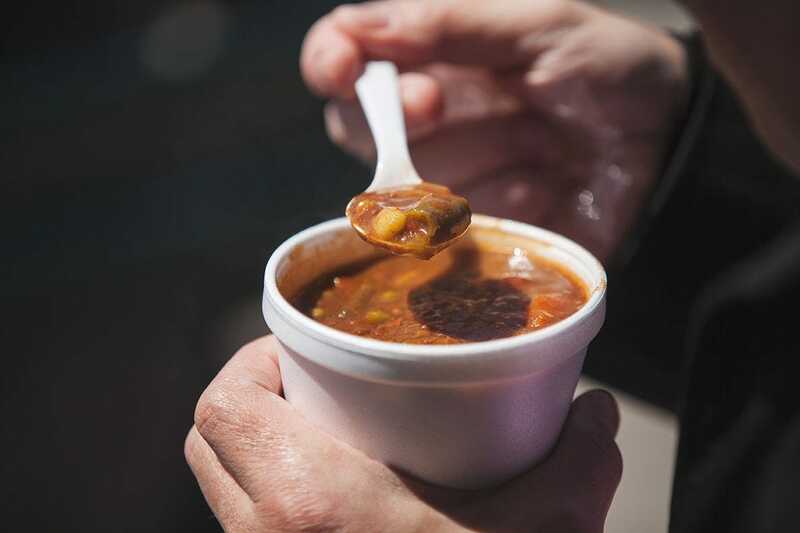 A day at the races wouldn’t be complete without a cup of Kentucky burgoo, at least if you’re at Keeleland. 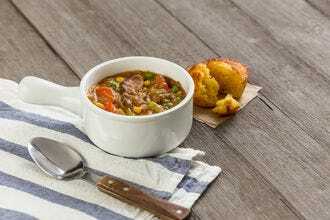 The Keeneland Classic Burgoo features beef, potatoes, roasted corn and a serrano chile griddle cake on the side. 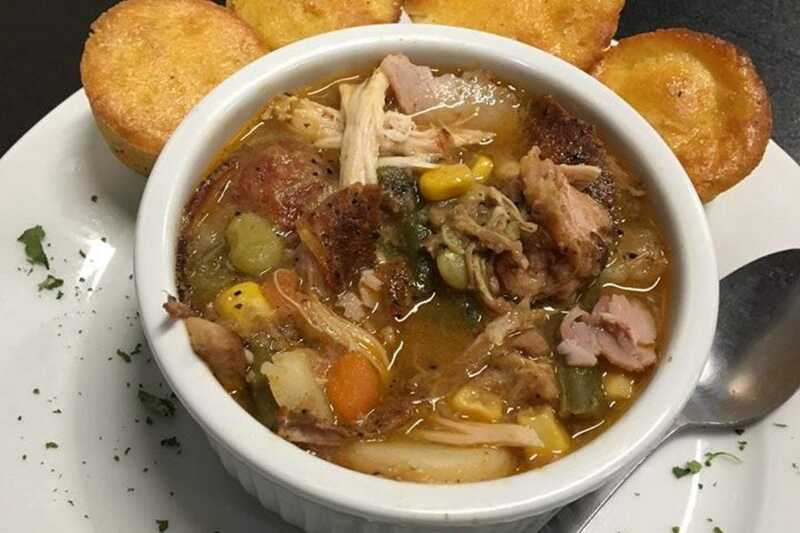 The folks at Dave’s Sticky Pig believe a good burgoo should be thick and hearty with a variety of meats. If you stick a spoon upright in the pot, it shouldn’t fall over. This version contains five smoked meats – pulled pork, beef brisket, pork ribs, ham and chicken – as well as plenty of seasoning for extra kick. The famous burgoo from Mark’s Feedstore has been on the menu for more than three decades. This diner favorite is made with smoked chicken, pulled pork and beef brisket, as well as a variety of vegetables. It’s served with a warm sweet and savory corn muffin to help balance the heat. The folks at Stella's Kentucky Deli in Lexington know that a spoon shouldn’t sink in a proper burgoo. This version is made with beef, pork, chicken, and lamb, alongside corn, beans and other veggies. It comes with mini corn muffins for soaking up the meaty juices. In Bardstown, Talbott Tavern puts their own spin on Kentucky burgoo by packing it with four types of meat, vegetables and a secret blend of spices with just the right amount of heat. The burgoo from Knockum Hill Bar-B-Que in Herndon is hearty and meaty. Each batch is made with a whopping five pounds of pulled pork, as well as a variety of vegetables. 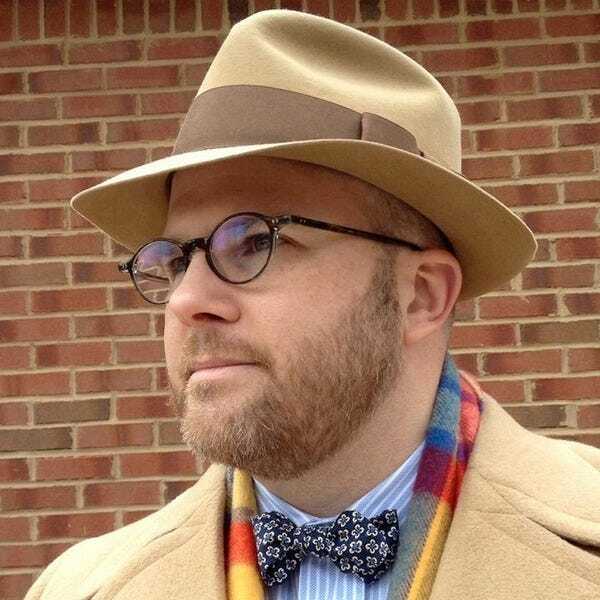 Alan Cornett, chief eater and writer for Eat Kentucky, is always searching for Kentucky's hidden food treasures, and he considers the Kentucky Hot Brown to be a perfect food. 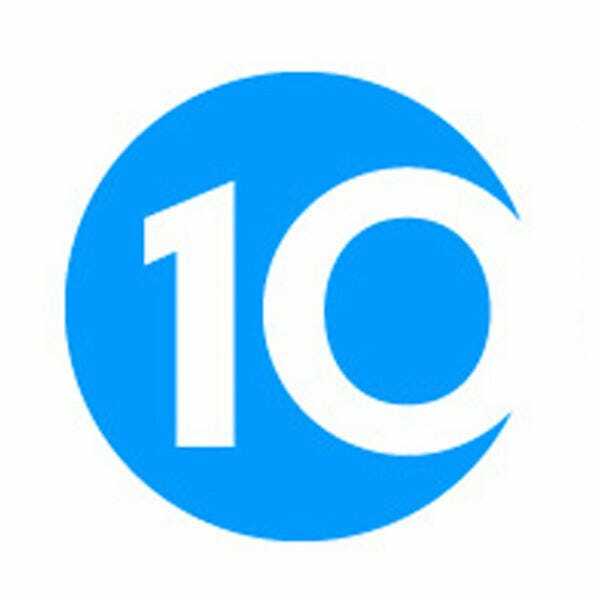 He lives in Lexington with his wife and three daughters where he also works as a Realtor. Follow him on Instagram.